Miss Abilene became 40th greyhound wearing the pink number 8 rug to win during February taking the total raised for the McGrath Foundation beyond $20,000 yesterday. In what was a relatively quiet day for the pink dog, with only two winners, the major milestone was passed at Geelong, with all milestones so far this month happening at regional tracks. 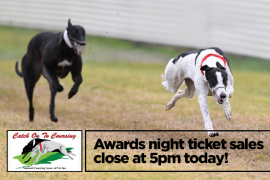 Greyhound Racing Victoria and Tasracing are aiming for $65,000 by the end of February, to help raise funds for McGrath Breast Care Nurses across Australia.